Israeli Prime Minister Benjamin Netanyahu (69-years) has won a fifth term in office. 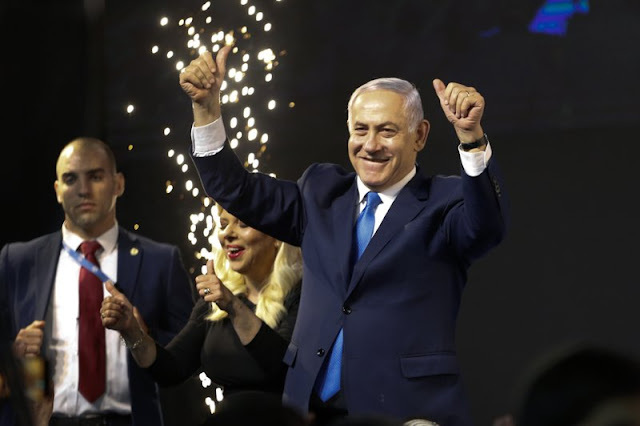 His closest opponent’s party the Blue and White party conceded defeat, clearing the path for Netanyahu to set up a coalition government. Benjamin "Bibi" Netanyahu was born in Tel Aviv in 1949. In 1963 his family moved to the US when his father Benzion, the historian and Zionist activist, was offered an academic post. He took part in a raid on Beirut's airport in 1968 and fought in the 1973 Middle East war. Haiti's President Jovenel Moise confirmed Jean-Michel Lapin as the country's new prime minister. Mr. Lapin (former culture and communications minister) succeeds Prime Minister Jean-Henry Ceant. Haiti is still recovering from widespread riots in February when thousands of people took to the streets across the country to demand better living conditions and the departure of the head of state. Transparency International places the country at number 161 out of 180 in its corruption ranking. Haiti is the poorest country in the Americas, with 60 per cent of the population living below the poverty line. In 2018, Haiti racked up a record USD 290 million deficit, while its national budget, the lowest in the Caribbean region, amounts to USD 1.8 billion. Union Steel Minister Chaudhry Birendra Singh resigned from the Union Cabinet as well as from the membership of Rajya Sabha. However, he will continue to be a member of the 'Bhartiya Janata Party' (BJP). Ambedkar Jayanti is an annual festival observed on 14th April to commemorate the memory of B. R. Ambedkar, the ‘Father of The Indian Constitution’. It marks Babasaheb Dr. B.R. Ambedkar's birthday who was born on 14th April 1891. Ambedkar Jayanti honours the Dalit icon who dedicated his life working for the upliftment of untouchables, women and labourers. Dr BR Ambedkar not just gave India its Constitution, but also played a key role in the formation of Reserve Bank of India - the country's central banking institution. Today, West Bengal is celebrating Bengali New Year's day (also known as Poila Baisakh). Several cultural programmes are also being held in different parts of the state depicting the culture of Bengal. The Bengali business community opens new books of accounts known as Halkhata on this day. Traders open new books of Accounts which is known as Haal - Khata. In Assam, people are celebrating the Rongali Bihu with joy and enthusiasm. Today is the first day of the Assamese Calendar and is celebrated as Manuh Bihu (People’s Bihu). Hussori troops are visiting houses especially in the rural areas and presenting Bihu songs and dances. A bench headed by NGT (National Green Tribunal) Chairperson Justice Adarsh Kumar Goel has formed a Central Monitoring Committee to enforce a national plan to reduce the river pollution. The Central Monitoring Committee will also coordinate with the River Rejuvenation Committees of the states and oversee the execution of the action plans. The first meeting of the Central Monitoring Committee may be held by 30th June. It will make over 351 river stretches across the country pollution free as it has caused a serious threat to the safety of water and environment. The Chief of the Naval Staff Admiral ‘Sunil Lanba’ has inaugurated the maiden ‘state-of-the-art’ Virtual Reality Centre (VRC) at the Directorate of Naval Design, New Delhi. This centre would provide a major boost to the Indigenous warship design capabilities of the Indian Navy. It will provide impetus to self-reliance and greater fillip to warship construction under “Make in India” initiative of the Indian government. This project will facilitate collaborative design reviews for continuous interaction between the designers and the end users to improve design and ergonomics onboard warships. Bengal has won the United Nations World Summit on the Information Society (WSIS) awards. According to chief minister Mamata Banerjee, “Utkarsh Bangla” and “Sabooj Sathi” projects have won the prestigious World Summit on the Information Society (WSIS) awards under the aegis of the United Nations. The “Utkarsh Bangla” project aims at creating a pool of skilled candidates who are industry ready. Under the “Sabooj Sathi” scheme, bicycles are distributed to students between class IX and XII studying in government-run and government-aided schools and madrashas of the state. The Bengal government has distributed nearly 1 crore bicycles since the inception of this project. The United Arab Emirates (UAE) is set to host the world’s foremost Artificial Intelligence (AI) Summit to empower global dialogue on the future of government, business and society. The inaugural 'AI Everything' (AIE) will take place at the Dubai World Trade Centre (30th April to 1st of May 2019). Emirates News Agency reported that the two-day event will bring together world leaders to define the underlying pillars of governance, business and society - augmenting the world’s happiness. It will be hosted by the UAE National Programme for Artificial Intelligence, with the support of International Telecommunication Union, ITU, and the World Intellectual Property Organisation, WIPO, and in strategic partnership with Smart Dubai. AIE will unravel real-world use cases across industries, and forge collaborations and partnerships, hosting over 130 influential speakers. American professional Golfer Tiger Woods (43-years) clinched his fifth Masters to land his 15th major title (first since 2008). Today's thrilling victory puts the former world No.1 just three majors behind the record of Jack Nicklaus. India finished with 5 medals in the Boxing World Cup, concluded at Cologne, Germany. Meena Kumari Maisnam continued her fine run to win gold in the 54 kg. Reigning youth world champion Sakshi (57 kg) and India Open champion Pwilao Basumatary (64 kg) settled for the silver. Pinki Rani (51 kg) and Parveen (60 kg) won bronze. Ethiopian athletes Gelete Burka (women’s race) and Abrha Millaw (men’s race) won the 43rd edition of the Paris Marathon. They led a record 60,000 participants to the finish line through the French capital. Millaw won the men’s race with a time of 2 hours: 07 minutes and: 04 seconds. Burka was the fastest woman with 2 hours: 22 minutes and: 48 seconds. Kenyan Paul Lonyangata, a two-time Paris Marathon winner, was the third-fastest man. In the wheelchair race, Julien Casoli won for the third time. The Paris marathon is one of the world's most popular running events. In motor racing, British racing driver Lewis Hamilton (34-years) won the Chinese Grand Prix for a record sixth time. The comfortable win was the 75th of Hamilton’s career, and second in a row after his lucky triumph in Bahrain two weeks ago. Valtteri Bottas was second for his team’s third one-two finish in as many races this season. Ferrari’s Sebastian Vettel took third place. The 2019 Chinese Grand Prix was a Formula One motor race that took place at the Shanghai International Circuit in Shanghai, China. The race also marked the 1000th Formula One World Championship race since the first World Championship race was held at the Silverstone Circuit in 1950.